When you are moving, you need to manage a lot of stuff. When missed, that stuff adds up and destroys the entire experience. Moving is not happy-go-lucky, by any means. But it is fun when done correctly and efficiently. You should be clear on several things to guarantee a smooth move. One of them is the boxes you will need. Boxes for moving are a unique kind of box which are durable and are utilized to pack away all your household items to relocate. You might find that some relocation services will offer you with the boxes you need to move. That’s true even though you might find it simpler to purchase your boxes. Some movers like for you believe that it’s not crucial what type of boxes you employ for packing of your stuff, as long as you find boxes for cheap or free. Nonetheless, the quality of the boxes for relocating you’re utilizing is crucial. That’s because the welfare of your items depends on it. You must consider purchasing small boxes of at least 1.5 cubic foot. 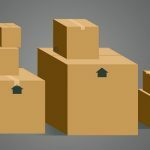 Those types of boxes are typically utilized for packing small appliances, fragile items, books, and kitchen items. For packing electronic goods, pots, pans, and clothes, moving boxes with a three cubic in size is the ideal box to use. Employ the boxes with a 4.5 cubic off to pack the bigger items such as linens. Boxes with six cubic foot size must be utilized for packing lighter but bigger objects such as pillows, toys, blankets, and chair cushions. Did you know that there’s one kind of box known as a wardrobe box? You might like to consider this kind of box for relocating your wardrobe. That’s because this box looks like a dresser drawer. Such boxes are useful in packing your clothes hanging on a bar. What’s more, you will find other kinds of boxes for relocating for packing various objects like pictures and mirrors. These will help you in relocating pictures and mirrors safely to the new location. Plus, they are ideal for making sure your commodities and goods are moved safely and effectively to the new location. You can purchase premium boxes from a store or search over the internet. One of the ideal ways to ensure that the boxes you bought are of moving quality is to buy them from suppliers that are reputed and sought-after. You can do your research online and check the internet for a plethora of suppliers. You can also ask for some customer reviews or feedbacks, so you understand the experience of their past clients. Take note that searching for a good quality box for your moving endeavor isn’t a complicated thing to do if you buy from a trusted supplier. For all your boxes and moving supplies visit uBoxes.com!